GE Animation has brought us a slew of Mega Man merchandise over the past several months. Charms, key chains, playing cards, posters, plush Busters... all kinds of stuff spanning both the Classic and X series. And as you can see from the post title, they aren't done yet. A batch of new Blue Bomber items just popped up over at GE Animation's official product page. 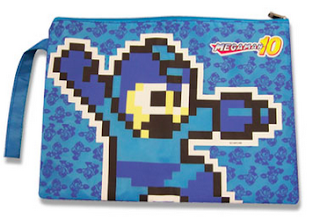 The latest listings includes an E-Tank throw blanket, a Mega Man X6 Zero wallet, an E-Tank PVC wristband, a file folder carrying bag, and a Mega Man 10 notebook. What's more, that adorable Mega Man Powered Up plushy we caught wind of has been delayed indefinitely. It was due out this month, but it appears GE aren't quite ready to let it loose just yet. As per usual, you'll find these products both online and in-store within the coming months. Availability varies on the retailer, so try to keep an eye out on more than one venue. Gotta say, that Zero wallet looks pretty boss. Inb4 Capcom is evil! we want more Megaman games not merchandise. to be honest instead of all this miscellaneous megaman stuff I'd rather see some more high quality megaman figures made by bandai or kotobukiya or another company that makes high quality figures. I could care less about bags, towels or wallets but I'm always interested in new megaman figures to add to my video game shelf. And I kinda have to agree with July 31, 2012 Anonymous. I don't mind the merchandise, but more quality merch would be better. yeah I don't mind the merchandise either, when I posted the above comment about the figures I just tend to prefer megaman figures over soft goods like bags, wallets and stuff like that. id really like to see a figure of bass and some robot masters made eventually because there isn't much out there other then figures of the main megaman characters. Agree with those who wish for good quality merch. I like these items, don't get me wrong! It's just action figures are so neat, especially when made by Kotobukiya! I think the plush doll is really the only worthwhile merch listed there. I can't help but feel bothered by how the site lists everything as "Mega Man 10 merch". That doll is Powered Up style for god's sake. does anyone know why the plush was delayed? Haha, after 1st Anon calls out people who whine about lack of games, the following posts are people whining about merch. Moral of the story: people enjoy complaining, regardless of subject matter. And to keep myself out of that equation, I like this new merch! what a rude comment undamned, I didn't see any whining just because other people prefer figures instead. you truly are arrogant. Moral of the story: people enjoy complaining about people complaining because they will accept anything regardless of quality and have misguided pride in Capcom. pretty much, I don't get why some people can't accept other peoples opinions. not everyone feels the need to go out and buy every piece of megaman merchandise released these days and the people like undamned who call people whiners that aren't rushing out to buy everything are just plain rude. I usually only buy megaman stuff that interests me and don't feel the need to own every piece of merchandise ever made. don't get me wrong, it's great to see megaman appearing on a lot of merchandise again but I'm only going to buy megaman merchandise that interests me. I personally did not find Undamnned's comment to be rude, but that's just my view point. I'm the same as everyone (or most) else, I don't purchase everything just because it happens to be official merchandise. If it interests me enough, or is in good quality, then I do. I mean, I definitely have my fair share of things that I would love to own. I don't mind the variety of stuff out there. It's not as if cutting off smaller merch like this will funnel into more high quality figures. Different companies, different goals. And seriously, an E-Tank throw blanket is kind of awesome. So, I'm game. More Mega Man! thetruelegend, I don't know if you were being sarcastic about the ruby spears megaman cartoon but I'm also a fan of it and I thought the figures based off it were great. I still have my megaman figures from 95 based on the cartoon.